Location, internship and career opportunities and our nationally and internationally recognized academic programs are just a few of the things that attract students to UMKC. What they come to love is our low, 14:1 student-to-faculty ratio. That means faculty know your name, are eager to build relationships with you and take mentorship seriously. 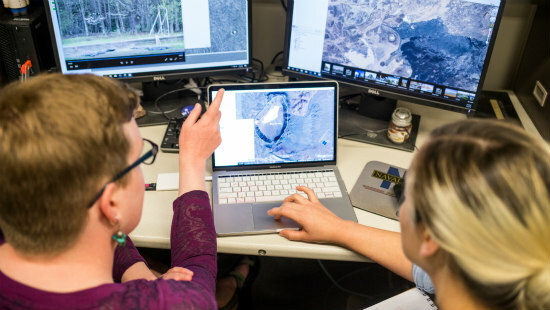 Assistant professor of geosciences Alison Graettinger and physics junior Julia Boyd are using satellite imagery to explore the depths of Mars through the study of planetary volcanoes. 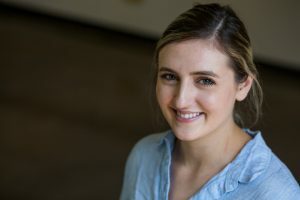 A double minor in mathematics and classical and ancient studies, Julia is new to the field of geology and says she benefits most from the one-on-one time for learning and interacting with peers, educators and her mentor. Hear from the dynamic duo about the benefits of mentorship at UMKC. How has your mentor inspired you? Julia: Dr. Graettinger has inspired me to step out of my comfort zone by taking my physics and math background and applying it to research based in geology. She has inspired me to use the perspective that I bring from my own field and apply it to many aspects of my research, while also learning methods of geology to identify maar and crater characteristics through satellite imagery. Dr. Graettinger has also sparked a desire for me to continue researching in the field of planetary geology. What makes faculty mentorship critical to the success of students? Alison: Mentors help push students to reach scholarly and personal responsibility goals that in-class interactions do not always allow. I also find that one of my most important roles as a mentor is being invested in the student and being a role model of a successful woman in science, both of which help motivate students to achieve their best. 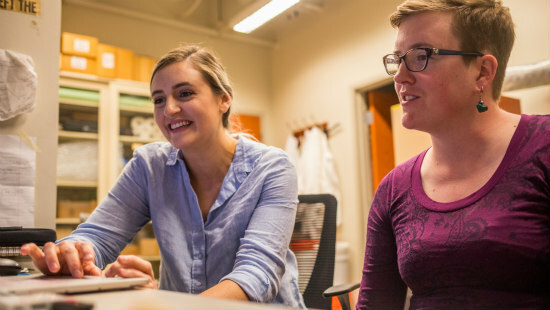 As a woman in science, how does mentorship help close the gender gap in STEM professions? Alison: When I got my first female mentor, it was something I didn’t know I needed. Finding someone who has something in common with you adds something extra because they understand your experience. How are you different now than when you first started at UMKC? Julia: I don’t think I had a good grasp and true understanding of my place in the world and how I was going to get where I wanted to go when I started college. My biggest fear was failure and not being good enough, both in my degree and just in general. I feel like that has really changed. Dr. Graettinger has also helped me build confidence in myself as an aspiring scientist. How has your mentor helped you grow as a person? Julia: It can be intimidating starting research and doing something different in a new field, plus I always want do things perfectly the first time. That is not the way the world works, though, and Dr. Graettinger has really helped me to learn how to channel my perfectionist nature and set realistic goals and be proud of myself for achieving them. I gain more confidence every time I reach a small goal, and in turn that gives me the confidence to set higher goals and actually achieve them. Alison: Step one is to want to be a good mentor. Realizing that mentoring is not something that just happens on its own helps mentors be able to support and motivate a range of students, not just students like themselves. Some people go their whole lives without having a mentor. What advice would you give people about finding one? Julia: Whether it be in academia or just in life, do not be afraid to ask questions and for help, guidance, or to find a community! 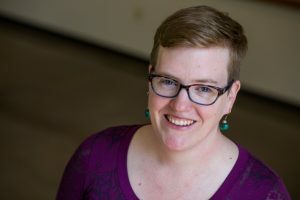 There are so many groups and communities of people here at UMKC that are both dedicated to helping others and who want to connect with people. Don’t ever be afraid to reach out to someone and get involved. Ask others for guidance, both instructors and peers, because 9 times out of 10 people will be honored that you even asked and would love to help you. Alison: Have a real conversation with your potential mentor first. Talk about expectations, goals and the project itself. 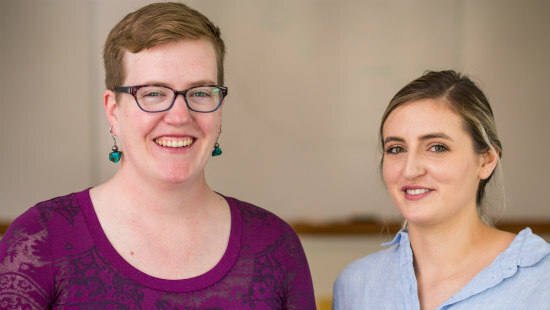 Hear from more #DynamicDuos on mentorship at UMKC.